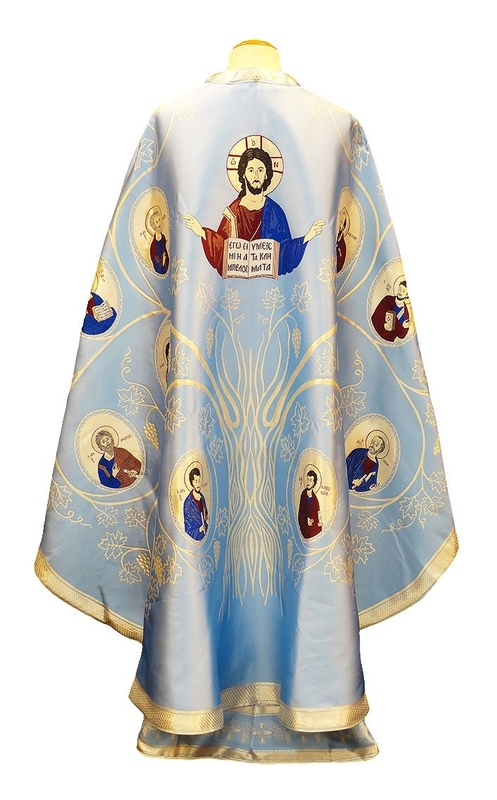 Orthodox Church liturgical Greek Priest clergy vestments (blue-silver) by Istok Church Supplies Corp.
Our blue and silver Greek Priest vestments are much in demand for celebrating feasts and days of the Holy Theotokos, Annunciation, Presentation of the Lord and during Lenten period. These made to measure garments are meticulously designed and rendered by our skilled tailors working at our workshop in Europe. 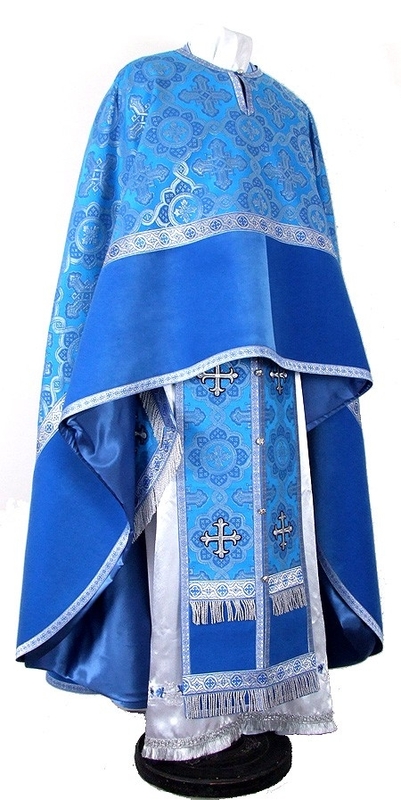 Istok Church Supplies has a fine collection of Greek Priest vestments blue and silver in varied shades of blue. We understand the religious significance of these garments and their bearing on the reputation of the wearer, hence we ensure that only the highest quality rayon and metallic jacquard brocade fabrics are used for their construction. 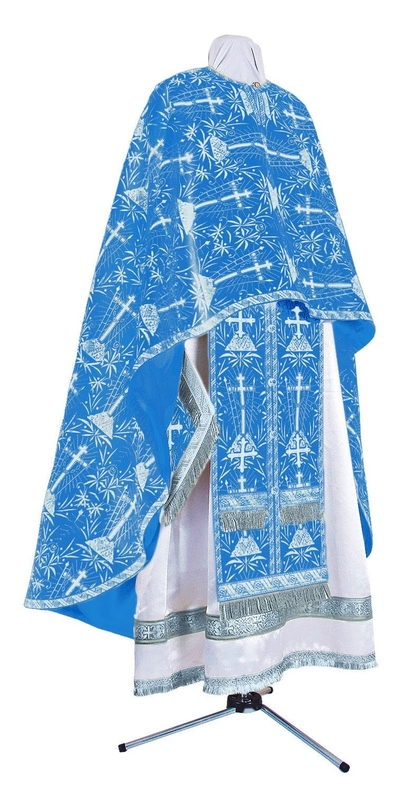 We offer complete sets of Greek Priest vestments exclusive of the podriznik. Items include phelonion, epimanika, epitralhilion, zone and epigonation. Podrizniks can be purchased separately from the corresponding section. Customers who like a particular product but would like it in a different fabric belonging to the same class as the one mentioned in the product can mention their preferences in the Notes section during check out. Customers can also add an exquisitely embroidered icon as well as matching chalice covers and veils to their orders for an additional cost. This will help ensure uniformity and aesthetics during Divine Services. A properly outfitted and comfortable vestment is a must to help clergy concentrate during long duration services. We strive hard to ensure that our Greek Priest vestments fit the wearer to perfection. We request patrons to provide their exact measurements online to make the work of our tailors easier and precise. Our Greek Priest vestments blue and silver are available with three distinct decoration options – standard, premium and luxury. We leave it to our customers to decide which decoration type they prefer on the basis of their requirements. We require three to five weeks for completing each individual vestment order –the sooner you place your order, the better it is. We are confident you will find something appropriate in our vast collection of quality Greek Priest vestments.